Eight speakers, MD8 player, eight different and synchronized tracks of looped sound each 5'7"
In 1964, the Panorama of the City of New York, commissioned by Robert Moses for the World's Fair at the current site of the Queens Museum of Art, was completed. Visitors could take an eight-minute tracked-car ride around the perimeter of the model, while listening to an upbeat tour of 'the Greatest City on Earth' narrated by Lowell Thomas. 'New York / New York,' consisting of eight simultaneously playing audio tours, draws from this precedent. 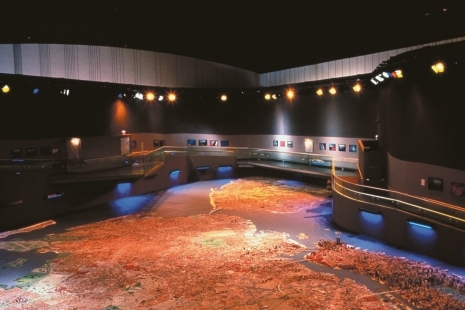 Each tour highlights places of significance along routes from the perimeter of the Panorama to the center, beginning at the (eight) points where the Panorama model physically touches the wall and concluding at the miniature model of the Queens Museum. There, they briefly synchronize. The tours, narrated by novelist Jonathan Ames, commence with a phrase from the World's Fair tour, and include other found texts as well. But while miming the tenor and rhythm of its 1964 antecedent, 'New York / New York' also distances itself. Its tours systematically conflate facts about New York City proper and the model; thus a good number of the City's buildings are claimed to have been built in 1964, or have been made of wood. The project is a collaboration with Trevor Mahovsky.